Ever since Robert Flaherty aimed his camera at an Inuit named Nanook, the documentary film has had to contend with its multiple and often conflicting functions: as an authentic representation of reality, as a vehicle for conveying ideology, as a work of art. While many documentaries of the past may seem quaint on all three fronts through today's eyes, they are no more problematized than contemporary works. As a distributor of contemporary Chinese documentaries, I see these issues figuring as prominently in many of the films I review as in works dating back 75 years, whose presumptions towards objectivity or sophistication belie prejudices in perception, culture and aesthetics. Such a work is Song of Ceylon. Conceived under the supervision of British documentary godfather John Grierson as a propaganda piece for British commercial tea interests, Song of Ceylon all but transcends its colonialist industrial premise. It's a bona fide work of art that celebrates the lives and values of native Sri Lankans while actively questioning the impact of the tea industry on their way of life. The film is blessed with an uncommonly musical sense of editing rhythm, lyrical camera movements that are rare for documentaries of any era, and best of all, a dense soundtrack that mixes native songs, nature sounds and industrial noise into what could work as a stand-alone audio drama. At the same time, the film can't fully overcome its thoroughly Western orientation even as it attempts to celebrate its subjects and critique the colonial forces threatening to alter their culture. The problems can be summed up in the selection of a British travelogue text from 1680 to serve as the film's primary narration. It's a poetic attempt to connect the way of life captured on film to an idea of an eternal Eden, to which the colonialist forces of commerce play antagonist. But the notion itself is a sentimental fiction that projects a romantic view of native life rather than letting it speak on its own terms (this despite having a man with a South Asian accent read the British text as a play for authenticity). The four-part narrative begins and ends with a cinematic tribute to Buddha, presented as an Oriental analogue to Christ for introducing spiritual civility to a land of pagans; again, another projection of Western meaning upon Eastern forms. In its attempts to critique the prejudices of Western colonialism only to arrive at new ones, the film becomes what may be the first work of neo-colonialist cinema. But there's no denying the sheer brilliance of the filmmaking on display, especially the third section, which takes documentary into a political and artistic dimension that's years ahead of its time. It's a dense montage that juxtaposes the imagery of the Sri Lankans laboring in various capacities against the sterile geometries and clanging electronic transmissions of a trade office coordinating their efforts. The incongruence of these two worlds - bodily vs. bodiless work - is so jarring that Eisenstein couldn't have done a better job articulating the alienation of labor in cinematic terms. All in all, Song of Ceylon is a rare film whose aural and visual rhythms and textures fully immerse the viewer into a singularly cinematic experience, regardless of its relationship to the reality being represented. The following votes were counted towards the placement of Song of Ceylon among the 1000 Greatest Films according to They Shoot Pictures, Don't They? No mere documentary, Song of Ceylon (originally released in England in 1934) has been described by some observers as a meditative experience and by others as "innovative, lovely, lasting." With the utmost respect (and a refreshing lack of "white man's burden" condescension), director Basil Wright offers a fascinating study of the Ceylonese people, their day-to-day existence and their ages-old customs. Of special interest is the film's emphasis on Buddhism, as manifested in the country's ancient sunken temples. Amidst this reverent splendor is an undercurrent of sadness, as the film shows how the West had already begun to commercialize Ceylon. Without taking anything away from Basil Wright, who not only directed but handled all the cinematography, it must be noted that Song of Ceylon was the brainchild of John Grierson, better known as "The Father of the British Documentary." It is currently available in video as part of a collection of Grierson productions, including Drifters (1929) and Industrial Britain. Made by the GPO Film Unit and sponsored by both the Empire Tea Marketing Board and the Ceylon Tea Board, Song of Ceylon is one of the most critically acclaimed products of the documentary film movement. It was hailed at the time of its release by author and film critic Graham Greene as a cinematic masterpiece, and received the award for best film at the International Film Festival in Brussels, 1935. The film is a sophisticated documentary, notable for its experimentation with sound. It features crucial input from Alberto Cavalcanti, who helped with the soundtrack, as well as composer Walter Leigh, who experimented in the studio to create a number of sound effects. One of the finest achievements of the British documentary movement was Basil Wright's Song of Ceylon, which has been called the world's finest example of lyrical documentary. The film's theme, as its producer John Grierson described it, is "Buddhism and the art of life it has to offer, set upon by a Western metropolitan civilization which, in spite of all our skills, has no art of life to offer." The film's narration was taken from a book written by Robert Knox in 1680, which Wright had discovered by chance in a store window. At the last minute, Wright inserted four titles which prescribes the film's symphonic structure: "The Buddha," "The Virgin Island," "Voices of commerce," and "The Apparel of the Gods." The first section, extremely slow, follows pilgrims up a mountainside to pray. The second shows the daily life of the people. "Voices of Commerce" juxtaposes two systems of labor, with the sound track ironically quoting British stock market prices and the arrival and departure times for ships while Ceylonese natives gather coconuts and tea leaves by hand. The last section returns to the religious and cultural life as it had been lived by the Ceylonese people centuries before the arrival of the British. Not everyone responded favorably to the film's poetry and beauty. Variety's reviewer called Song of Ceylon "a shade too arty," despite its "splendid camera work." John T. McManus, in the New York Times, attributed the film entirely to John Grierson (without mentioning Basil Wright's name) and seemed bothered by what he called the film's "basic aloofness." He objected not so much to the film ("beautiful job. . . striking in photographic values. . . painstaking in composition and montage") as to its approach. "It certainly deserves the prizes it has won, but there are prizes it could not win," McManus concluded. The same could be said, however, for any film which, like Song of Ceylon, is one of a kind. Basil Wright summed up his feelings about the film in this way: "I think Song of Ceylon is the work of a young man exposed for the first time to an oriental as opposed to occidental way of life, and to a very impressive and convincing oriental religion . . . . Without any question it's the only film I've ever made that I can bear to look at." Wright directed or co-directed some 25 other documentaries (including the celebrated Night Mail, with Harry Watt, and World without End, with Paul Rotha). He was also author of many film articles and reviews, as well as two books—The Use of Film and The Long View. Song of Ceylon, Basil Wright the principal creator, is one of the accepted masterpieces of documentary. Sponsored by the Ceylon Tea Propaganda Board (Ceylon today is Sri Lanka), it is first of all remarkable in being so fully and freely a work of art while doing so little to sell the sponsor's product, perhaps even subverting its main goals. It may be even more remarkable, within the body of early British documentary, as a highly personal work, which, furthermore, emphasizes matters of the spirit. It is a moving hymn to a native people, their work, their ways, and their values in conflict with imposed requirements of modern commerce. Formally, in aesthetic terms, Song of Ceylon is the most complex and sophisticated artwork of British documentary of the 1930s. Though it contains exquisite images of a golden time and place, not unlike those of Flaherty's Samoa in Moana, Wright's discovered Eden has a discordant note accompanying it. The commentary is drawn from a 1680 book on Ceylon by the traveler Robert Knox. It provides an appreciative description of traditional life, which we see and also hear in reverberating gongs, native music, and rhythmic chanting to the dancing. In the third sequence, entitled "The Voices of Commerce," the discord erupts. Images of the indigenous and traditional are here accompanied by deep whistles of seagoing freighters, Morse code beeping on the wireless, English voices dictating business letters and listing stock market quotations. This medley of sound, plus a musical score suggesting an Eastern modality composed and conducted by Walter Leigh, was supervised by Cavalcanti. In addition to Wright's principal role, Leigh, Cavalcanti, and Grierson, to one extent or another, were all involved in the creation of the whole, which can astonish and delight audiences as much today as it did when first shown. Song of Ceylon is the first great realization of the classic documentary texts of the 1930s. Exemplifying a new form of expression, it announces a period of experimentation that would produce the movement's most interesting films. The film is extraordinarily complex, much more complex than one could anticipate from a young filmmaker working within a newly formed and largely amateur production unit. In 1933 Wright, by his own admission, was still a neophyte in many respects, and, like the genre itself, open to a variety of experimental tendencies. Wright explicitly recognizes two crucial influences: the work of American documentarist Robert Flaherty and of Brazilian/French filmmaker Alberto Cavalcanti, both "marginal" innovators who, in the early 1930s, conserve the spirit of experimentation apparent in their earlier silent films. Song of Ceylon is also complex because it embodies the political contradictions the documentary movement assumes by its position within the British state apparatus. On the one hand, the British documentarists identified themselves as socialists with a "socially progressive outlook"; on the other hand, they worked within a conservative state bureaucracy that demanded restraint and self-censorship. It is not surprising to find, therefore, that Song of Ceylon is, in many ways, a dissonant text, the locus of conflicts of an ideological nature. Moreover, Song of Ceylon, commissioned by the EMB and the Ceylon Tea Propaganda Board, raises the colonial question: how are British filmmakers to position themselves with regard to British exploitation of its colonies? - William Guynn, "The Art of National Projection: Basil Wright's Song of Ceylon" Published in Documenting the Documentary, edited by Barry Keith Grant and Jeannette Sloniowski. Pages 83-84. Once a routine entry on lists of the all-time ten best films, Wright’s Song is rarely sung anymore for its perceived chauvinism, although Wright may be ironically undercutting chauvinistic notions voiced in the late seventeenth-century text (by Robert Knox) that the film’s narration draws upon. Everyone agrees that the film is lyrical. The opening tests the possibility of Wright’s irony. Ceylon’s “dark forest,” which the narrator (quoting Knox) says existed “since ancient times,” plants the land and its people in the symbolical “darkness” of ignorance, backwardness. But the accompanying tracking shot through forest is most striking for shafts of intense sunlight! The narrator proceeds to describe natives as making themselves “prostrate to the Devil” at night; but the accompanying image of grotesquely masked figures dancing in fire-lit darkness is sufficiently fantastic to suggest a dream, one perhaps lodged in the “civilized” Western mind that, we cannot help but note, presumes a literal belief in the Devil! In any case, the narration explains that Buddhism replaced such devil-worship as the film moves from night to day and from gaudy, pulsating closeups to orderly long-shots. We suddenly realize that the devil-dance is a performance, a reconstruction. Song of Ceylon shows the land, people, and their customs, and most important of all, integrates many aspects of Singhalese life into the film, so that one is left with an impressionistic, but also seemingly accurate, picture of a foreign land. In accomplishing this, it also manages to avoid the cliches and predictable juxtapositions of the travel film genre. Technically, it makes significant advances in the use of combined dissolves, superimposition of visual images, and counterpoint sound. Altogether, it is a film of refined composition, restrained impact, yet rare power. - Richard Meran Barsam, Nonfiction Film: A Critical History. Published by Indiana University Press, 1992. Page 93. Song of Ceylon won enthusiastic plaudits at the London Film Society and went on to successful theatrical showings. Perhaps the Ceylon Tea Propaganda Board was delighted with it: the film put the Board on record as fervently admiring the Ceylonese and their culture. It made clear the role of tea as an imperial link. To others it may have suggested exploitation. Without question, the film made the rising British documentary movement known throughout the world. - Erik Barnouw, Documentary: a History of the Non-fiction Film. Published by Oxford University Press US, 1993. Page 93. Wright attempted in Song of Ceylon to give expression to the distinctive texture of modern life. In so doing, he created a symphonic poem. For he sought not only to uncover the different rhythms of the modern world, but to explore their interconnection through the construction of a complex whole. As the film's title suggests, Wright took a village in Ceylong as his focus; but in celebrating its rhythms of spiritual and material life, he revealed, simultaneously, its existence within an extended world of trade and commerce. Moving effortlessly between inside and outside, past and present, rural and urban, religion and commerce, the village and the world, Wright weaves together overlapping, intersecting and cross-cutting currents. As one critic wrote: '[Song of Ceylong] is a very important attempt at creating a picture of an entirely strange life, from the native rather than the foreign point of view, and to express the tempo of that life in the texture of the film itself.' The formal inventiveness of Song of Ceylon, the skillful use of the new medium of sound as a counterpoint to visual sequences and text, thus mirrors the complex and fluid world which Wright evokes through the substance of the film itself. Wright's concern with complexity and movement in his 1935 work may be considered as a continuation of the tradition associated with the European and Soviet film-makers, such as Ruttman, Cavalcanti, Ivens and Vertov. During the 1920s, this group established a new genre, the city symphony. It was uniquely cinematic, and the use of montage represented a profound rejection of conventional forms derived from a literary aesthetic. Taking the city as a focus, these film-makers gave expression to the modernist fascination with speed, movement, machines, structure and process; and, for them, the cinema was an integral part of this new industrial, mechanised world. The camera itself moved as a machine, and as an advanced scientific instrument it could transcend human limitation. Cinema was celebrated as an industrial product, at the site of both production and consumption; the complex social relations embodied in cinema mirrored the characteristic features of the modern age. But Song of Ceylon also marked a new departure in the tradition of the city symphony, not least because its centre was not the city per se. Although the film's formal qualities and construction owe much to Berlin - Symphony of a Great City (Ruttman), The Bridge (Ivens) or A Man With a Movie Camera (Vertov), its distinctive feature is the humanism of its vision. For, in important ways, Song of Ceylon echoed the poetic humanism most associated with the work of Robert Flaherty. If, on the one hand, the city symphony films were criticised because the people in them were turned into mere cogs in a vast industrial machine, objectified and dehumanised by an omniscient camera eye, the limitations of Flaherty, on the other hand, stemmed from his refusal to address movement or change at all. Wright, however, achieved a new synthesis, fusing the romantic lyricism of Flaherty with the intellectual brilliance of Ruttman. By its musical title, Song of Ceylon evokes the symphonic documentary, with which it shares several textual problems. The unity of place is even more nebulous in Wright's film than in the symphonic documentary - most of it takes place "somewhere" in Ceylon. Moreover, the linear concept of time is suspended, since one of the concerns of the film is to evoke the timelessness of traditional Ceylonese life. Finally, the film abandons the notion of the individual human agent. The "actor" may appear in a cluster of shots showing a specific action - we see several views of a young man climbing a palm to harvest coconuts, for example - but he never reappears beyond the confines of the sequence. Consequently, there is little sense of continuity of action as performed by individual human agents. In Song of Ceylon, editing is truly an art, since it demands the conspicuous intervention of the "filmmaker" who articulates shots on the basis of paradigms that are not already given and that the text must work to establish. 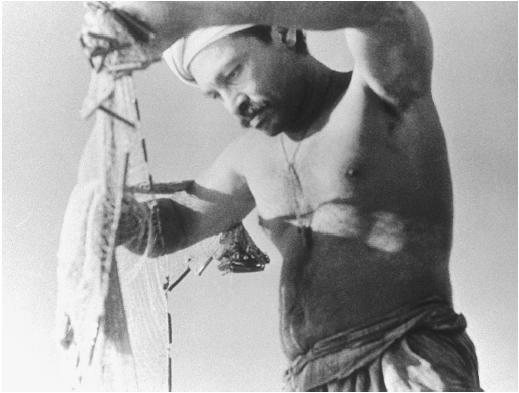 Song of Ceylon, like symphonic documentaries, makes use of a complex visual rhetoric to link the shots in figurative or conceptual relationships. Continuity is often established through the artifice of form: repetition of camera movement, repetition of motifs, repeated dissolves. To the extent that they are liberated from narrative necessity, images are opened to other principles of association and therefore to other kinds of meaning. In the closing sequence of Part I, for example, figurative comparisons between the motifs are suggested through the formal device of a consistently moving camera. We see birds taking flight, Buddhas erect and reclining, and progressively more open landscapes - images that do not suggest a coherent physical place but transcendence, an ascent toward the divine. In Part III, which describes colonial exploitation of Ceylonese labor, the visual track is structured conceptually through a series of oppositions between the traditional and the modern, represented in alternating sequences: a segment describing the harvesting of tea by manual labor, for example, is followed by three shots of industrial machinery. This conceptual dissonance also occurs within certain sequences: an ocean liner appears as an unexpected insert within a sequence showing the harvesting of coconuts; inversely, an incongruous elephant disrupts a sequence devoted to describing commercial telephone and telegraph communication. In Song of Ceylon we see the Art of National Projection caught in fundamental ambivalence. Commissioned as a work of propaganda to present positive images of the British Commonwealth, the film produces instead an ecstatic evocation of a paradise nearly lost. Rather than discovering in the world of commerce and its colonial outposts new representations of humanness and beauty, Song of Ceylon produces a critique of the whole enterprise of National Projection, stigmatizing the British presence as callous and exploitative. However, Song of Ceylon also reveals another basic ambivalence, this time toward the subjects it claims to represent. In "speaking for" the Ceylonese, the film reduces them to silence. It appropriates their images and subjects them to the distortions of exoticism. They become, in effect, terms in a discourse of protest against the reality of social relations in the industrial era. - William Guynn, "The Art of National Projection: Basil Wright's Song of Ceylon" Published in Documenting the Documentary, edited by Barry Keith Grant and Jeannette Sloniowski. Pages 90, 91, 92, 94, 97-98. The humanitarian poet of the British documentary movement, Basil Charles Wright was born into a wealthy liberal family in Sutton, Surrey, on 12 June 1907. After attending Sherborne School he studied classics and economics at Cambridge University. Intending to become a creative writer, he fell under the spell of Europe's advanced cinema and began to make amateur experimental films with his own camera. In London his interest in the aesthetics of film-making was fed by screenings at the Film Society . Impressed with one of Wright's efforts, John Grierson hired him in November 1929 as the first recruit at the Empire Marketing Board Film Unit ; they remained lifelong associates. Initially Wright edited existing footage to fit EMB purposes, most elaborately in Conquest (1930), designed to show industrial technology's role in the development of North America. Russian montage habits influenced the cutting, though better indications of Wright's mature work appeared in films made from his own material: The Country Comes to Town (1931), a hymn to food manufacture in the countryside, and O'er Hill and Dale (1931), documenting the lambing season on the Cheviot hills. In The Long View , his history of cinema, Wright used as an epigraph Grierson's phrase 'All things are beautiful if you have got them in the right order', and these modest films - observant, precise yet lyrical - launched Wright's own search for the most perfect order, the most beautiful things. In 1933, the year when the EMB film-makers metamorphosed into the GPO Film Unit , Grierson sent Wright to the West Indies and Ceylon to shoot material for packaging into promotional one-reelers. In Windmill in Barbados (1933) especially, evocative photography blended happily with fluid editing and authentic sounds, though the aesthetic triumph masked Wright's struggle, here and elsewhere, to puncture the official line by criticising colonial exploitation. The trip to Ceylon, with John Taylor as assistant, duly generated its own one-reelers, but the principal outcome was The Song of Ceylon (1934), Wright's most acclaimed and personal film: a four-reel symphony of images and sounds, forged from the director's newly-born passion for the Orient and the Buddhist religion. The four sections evoke Sinhalese life and culture in images photographed and edited with immense finesse, shaped within a montage-driven circular structure inspired by the magic circle of the Buddhist mandala. The film is also notable for its complex soundtrack, recorded in close collaboration with the composer Walter Leigh , brilliantly juggling native and Westernised music, spoken commentary, and the shivers of reverberating gongs in unexpected, disjunctive combinations of sound and image. If Wright had found 'the right order' in The Song of Ceylon , the order proved difficult to recapture in films with less exotic subject-matter. As his career developed, he became increasingly sucked into producing, never his favourite task, though he made vital contributions to major films, including Night Mail (d. Harry Watt, 1936) and A Diary For Timothy (d. Humphrey Jennings, 1946). In 1937 he formed the independent documentary unit Realist Films . The first year's crop included Wright's Children at School (1937), a three-reel report on state-supplied education in Britain, its facts and analysis enlivened by the director's sensitive eye and the camerawork of A. E. Jeakins , henceforth a regular collaborator. The Face of Scotland (1938), made for the Films of Scotland scheme, avoided pretty scenery-gazing for a poetic treatment of hardy lives and a challenging environment. Writing, lecturing and administrative work kept him from directing during the Second World War. He produced official propaganda films through the Grierson-dominated Film Centre and, following earlier experiences with World Film News , helped found and edit Documentary News Letter , the movement's chief mouthpiece during the 1940s. After briefly serving as supervising producer at the Crown Film Unit , in 1946 Wright founded International Realist - a name in line with his strong conviction in cinema's power to spread understanding. Waters of Time (1951), his first major post-war film, made with Bill Launder for the Festival of Britain , looked no further than the Port of London; but its mastery of its topic was typical, along with the balance between lyric poetry and practical fact. World Without End (co-d. Paul Rotha, 1953), a survey of UNESCO's work in Thailand and Mexico, proved less visually appealing but better fitted the International Realist template. In his remaining output, Wright's love of Greek culture inspired Greece The Immortal Land (1958) and a shorter survey of Greek sculpture. The Stained Glass at Fairford (1956) surveyed a Gloucestershire church's medieval windows, while A Place for Gold (1960) celebrated the craft of its sponsors, the Worshipful Company of Goldsmiths . All imparted their material crisply, sometimes poetically, though with little sign of the creative heat that had generated The Song of Ceylon - the masterpiece made when Wright the artist had not yet given way to Wright the public servant. In retirement, Wright gathered his experiences and knowledge into his personal history of the cinema, The Long View, published in 1974. He died in London on 14 October 1987.